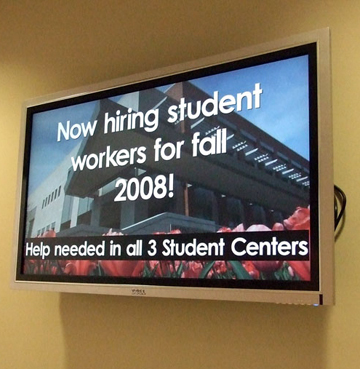 Primarily deployed in common areas such as cafeterias, student lounges, libraries and facility lobbies, digital signage provide a critical link between campus administrators and the student body and facility. Digital Signage easily attracts attention while visitors are passing by, while still relaying information to them as they pass. The digital signage provides student marketing with constant updates and reminders of daily announcements to using text, photos and video. Student government and groups can do student marketing and parent communication to publicize meetings and events. Students, faculty, staff, parents and visitors can check back throughout the day for the latest time and location information. Traditional bulletin boards and printed posters can't keep up with digital signage in schools. Digital signage can instantly display messages when prompted, allowing for emergency or critical messages to be seen faster. Whether the students are standing in line or sitting down to eat, digital signage is a great way to catch attention. In addition to the specials of the day users can post current local weather, stock market updates, or breaking headline news to help students stay informed on local and world events. Individual or multi-campus digital signage systems help schools deliver information and emergency alerts. Information travels at the speed of "life" today so schools and districts must focus on ways to deliver important information quickly and broadly to all staff and students. Digital Signage is also a great way to rapidly deploy information to every visitor that walks through your doors. Are you interesting in digital signage for your school? Contact us today for a free consultation. Let us help keep your school connected or download our free wireless design guide.